​June 19th (formerly known as Juneteenth) is not the only Emancipation Day celebrated by African-Americans nationally. Washington, D.C. celebrates the signing of the Emancipation Act by Abraham Lincoln on April 16th with the entire month of April dedicated to the observance of the ending of slavery. April 30th is Emancipation Health Day earmarked as Emancipate Yourself from Medical Mental Slavery Day (EYFMMSD). The day is one of self-awareness, predicated on how one consciously takes care of one’s health and heal one’s body. The brain child of Karen Khadijah Davis-Foulks, Conscious Self-Healthcare Educator and pioneering bio-energetics bio-informational wellness specialist (non-secular science of Quantum Health and Healing) established April 30, 2011, EYFMMSD was created out of the need to re-educate and remind individuals of the powers they possess as divine beings born with the birthright of pure health. Join us each year on this day as we honor those who have taken back control of their health and healing freeing themselves from pharmaceuticals and the brainwashing from the Western Medical Industry living a life style of Conscious Self Health Care. The Emancipate Yourself From Medical Mental Slavery “art” was specifically designed for this effort. 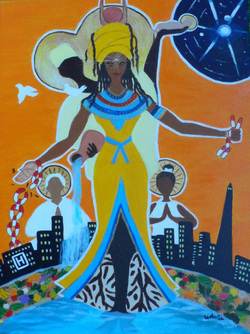 The print, donated by visionary artist, Wanda K. Whitaker, symbolizes the breaking away from the old paradigm of putting all the responsibility on the physician and medical healthcare system to conscious self-care healthcare. Art is known to be therapeutic and healing. The art print contains symbols representing sacred geometry patterns, healing color frequencies and ancient Egyptian and Yoruba knowledge. It was composed to reprogram the subconscious mind and alert the conscious mind to make a shift towards conscious healthcare that will benefit individuals, families and the entire community. Place your order today and receive the licensing rights for only $100.00 that allows you to print the image yourself in any dimension you choose and sell it to others. You may choose to print t-shirts, coffee cups, magnets, etc. or, buy a print for as low as $15.00 and hang it on your wall at home or in the office. The choice is yours. Just imagine, how such a low investment can garnish hundreds and thousands more, to keep a program going or to pay a bill to keep your organization operating. The Emancipate Yourself From Medical Mental Slavery “Art of Shift” effort is based on the true values of trust, honesty, communal prosperity and universal laws.